At the beginning of October, my father came to South Africa. He is an oil, gas and coal engineer and had some meetings in Sasolburg, preceded by a conference in Jo’burg and he stayed on for the week-end. He came and spent the weekend with me and having lived in Jo’burg in the 1960’s and 1970’s showed me around what was then Transvaal. On the Saturday, we drove out to Rustenburg, which is where there are Platinum mines. 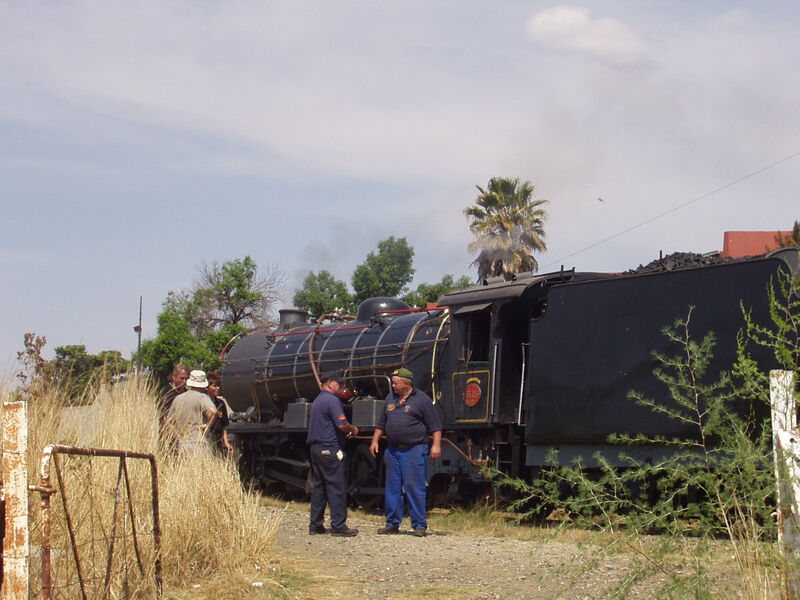 The two biggest platinum mines in the world are within 14km of the town, more platinum mines are being developed on a large scale in the area and there are other mineral mines such as chrome, palladium, nickel and copper. There are large granite quarries 19km from the town. The various types of mine dumps I’ve seen so far make the mineral richness of this country very obvious even just to a casual observer who can’t tell the difference between the minerals being mined which gave rise to the dumps. The gold dumps in Johannesburg are quite clearly gold-mine dumps as they still contain an element of gold, so they are yellow. They are being re-mined now that better science exists to extract the gold from the ore.
We took the country road, route 24, through the Magaliesberg mountains. We stopped off for lunch in the town of Magaliesburg where I’d had tea with Oscar a few weeks ago. 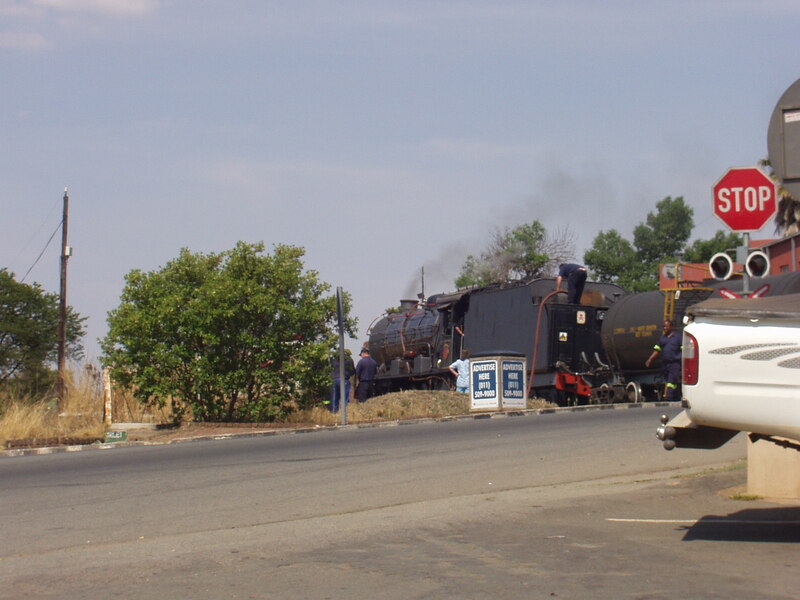 As we were eating by the side of the railway line, an old steam locomotive went past. When we came out of the restaurant we found it was only the other side of the road crossing and its water tank was being re-filled. 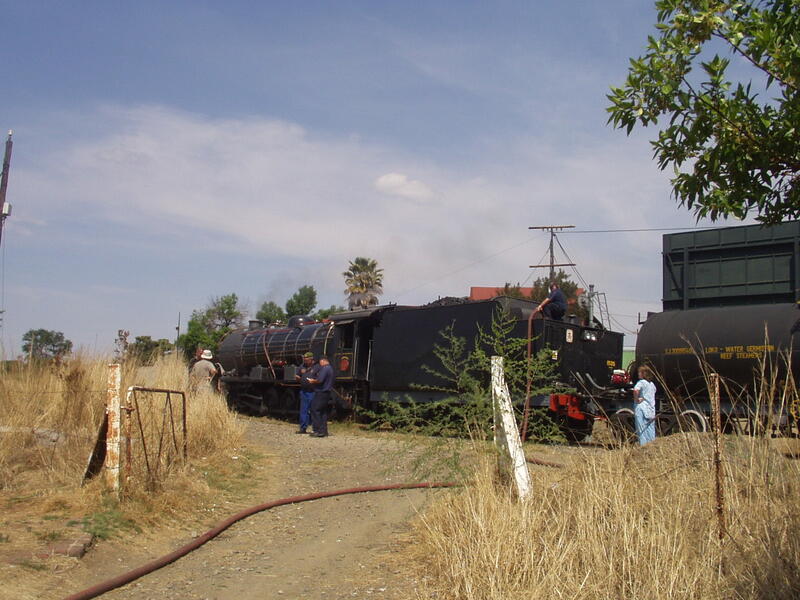 I duly took photographs of it for the benefit of the train lovers in my family! Driving through the Magaliesberg hills we saw some spectacular sights. I was intrigued about how they may have come about, as in shape they didn’t seem that dissimilar to the foothills of the Himalayas I’d seen when I was in Darjeeling in the 1990’s. They definitely didn’t seem to be volcanic. As they are on the African continental plate, I didn’t think they could have arisen the way the Himalayas did through continental drift. I did a bit more research on this (you’ve got to love google!) and found that they form the northern edge of what is called the Johannesburg dome. The Witwatersrand (often just shortened to the Rand) which runs through Johannesburg makes up the southern part of a circle of hills. It is one of two practically circular sets of mountains in South Africa, the other being centred on the now town of Vredefort. 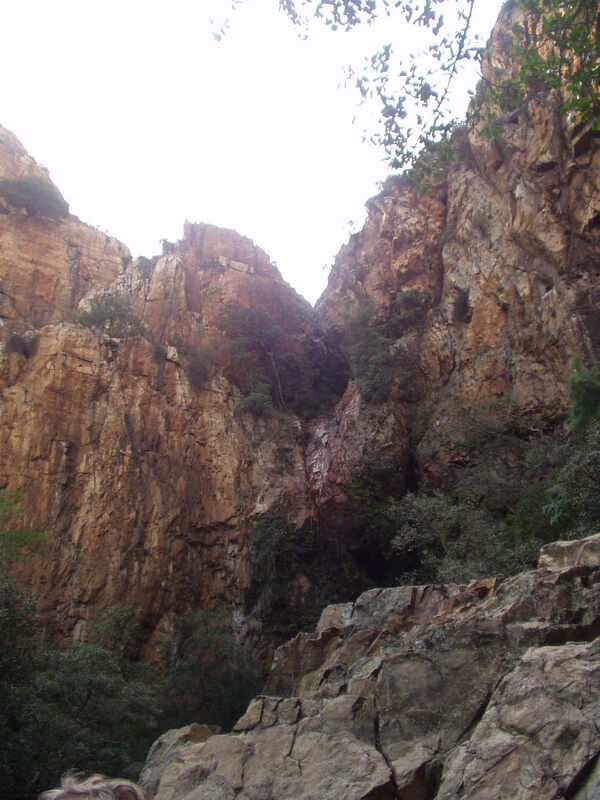 As I learned from the website of the Hartebeesthoek Radio Astronomy Observatory, the Magaliesberg – Witwatersrand feature is the result of natural uplift of sedimentary sandstone layers from below – what was once the bottom of a sea – so that the Magaliesberg rock layers slope down to the north, while the Witwatersrand rock layers slope down to the south. The “Johannesburg Dome” in the centre this feature is occupied by the archean granitic crust, some 3000 to 3400 million years old. 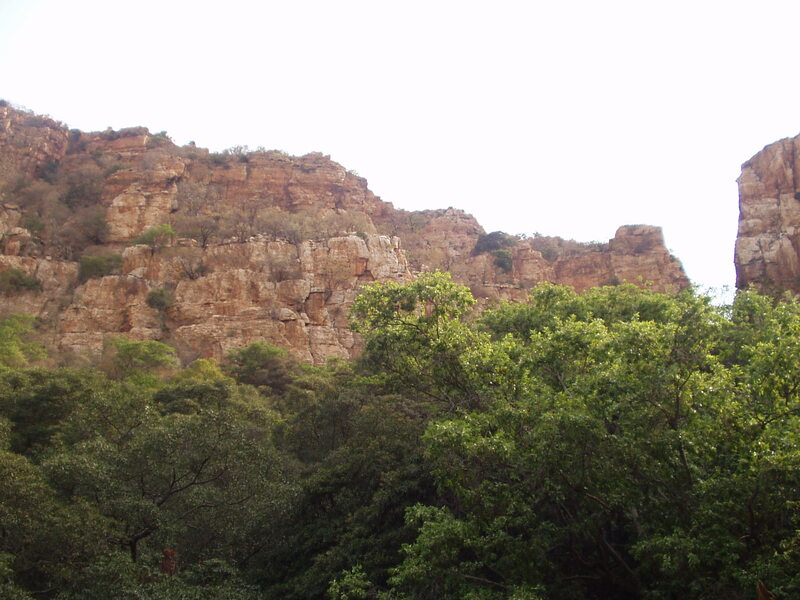 The same rock layers seen in the Witwatersrand are found in the Vredefort dome hills, but here they are found standing nearly vertically – the result of extreme uplift. 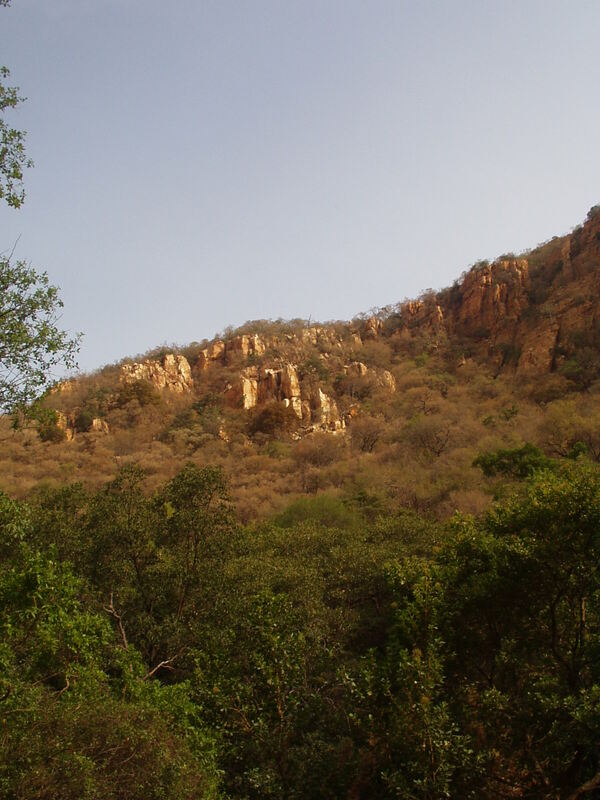 Evidence has been found by geologists that the cause of this uplift around Vredefort was an extreme impact event, caused by an asteroid some 10 kilometres in diameter. The ring of hills around Vredefort we see now are the eroded remains of a dome created by the rebound of the rock below the impact site after the asteroid hit. The original crater, now eroded away, is estimated to have been 250 – 300 kilometres in diameter. Some 70 cubic kilometres of rock would have been vaporised in the impact. There is less research available on the internet on the Magaliesburg – Witwatersrand feature, but I presume it was also created by a meteorite; however I have no idea how big it was. In the hills on the west of Rustenburg is the Rustenburg Kloof, which used to be a fenced off area where you could have a braai (BBQ to most readers here!) and go for walks up the hill to the Kloof, or cleft in the hills. The last time my father went for a walk up the Kloof was in the early seventies, he had been back in the 1980’s but didn’t scramble up the paths. Since then the area at the bottom of the hill has been made into a holiday village with various chalets. We were able to go in as day visitors and walked up the side of the ‘river’ towards the main Kloof. The river is not much more than a trickle at the moment, but it is nearing the end of the dry season here, and as the summer’s rains start, I presume it does become more of a river. We drove back to Jo’burg on the Brits road, crossing the Hartbeespoort dam. It’s quite a short dam between two hills in the Magaliesberg range; however a very large lake was created as a result of the dam. It is where the Transvaal Yacht Club is located and the vegetation in the towns on the side of the lake is amazingly luscious. Bougainvillea is all along the roadsides, some of the plants are obviously very old as they have quite big trunks! As we were driving through the towns, we didn’t actually stop to take pictures to share, but it was quite a sight nonetheless.